Purnima Exports is an 100% export house engaged in the manufacture, exports and supplying of Ladies fashion wear, high-fashion ladies evening apparel across the globe. We deal in all kind of fabric and every kind of garments. Be it Women Wear or Dresses For Juniors. We can handle all kinds of, embroidery, beading, hand-detailed work, printing & pleating. Our product range includes Ladies Garments Sequin & Beaded, Prom Dresses, Cocktail Dresses, Evening Gowns, Wedding Gowns, Ladies Corset, Ladies Top, Kaftan & Tunics, Ladies Blouses, Ladies Office Wears, Ladies Business Suits / Work wear. We also supply Designer Scarves & Stoles along with the dresses. Our entire range is available in varied colors, sizes, fits, cuts and designs. Purnima Bansal who is graduate from NIFT as Fashion Designer got a chance to represent Frankusher, UK as their Quality Controller and Sourcing agent in India for their Hi Fashion Evening Dresses. She worked to Frank Usher for 3 years as their representative. She designed some dresses which got approved by American Style ( was a Fashion House in Germany) and they asked her to manufacture and export them, that is how she came into export line. In 1990 she started her own company with name of Purnima Exports dealing in just Hi Fashion Evening Wear for upstreet market. Our clients were American Style, Scala (USA), Tesco, Little Woods, Debenhams. Since then we have worked with many wholesalers and buyers. We have a Skilled workforce which works with instant dedication and to ensure complete customer satisfaction. Every person in team has in depth knowledge about their specific domain and a good industry experience. At Purnima Exports we encourages young talent as they believe in fostering fresh concepts, enthusiastic environment and smart working. for checking each and every stage of our production process to ensure high quality standards. Our company strives hard to be able to maintain a position of leadership in the industry. We believe in total customer satisfaction as customer satisfaction is one of the most important fulcrum of any organization. We also formulate tailor-made products as per the specification of the customers. Our products are delivered to the clients on time. We have been following ethical business principles since the beginning and always believe in having transparency in business dealings. This is why most buyers love working with us. We have worked with both small clients having small quantities as well as big wholesalers. We have also work with Fashion Designer Creating their collection and making their production in house. We are 100% export oriented unit hence our main markets are Europe, USA, Brasil, North America, Canada, Australia, New Zealand, Saudi Arabia, UAE and Some Middle East Countries. 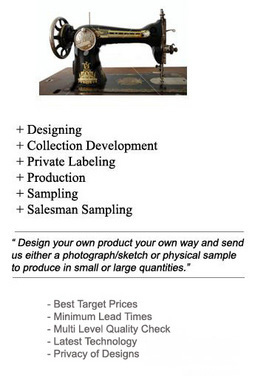 Our previous clients included Frank Usher, The American Style, Debenhum, Pierre Cavallo, Little woods llc, etc. Browse through our product range. All products have been manufactured by us.